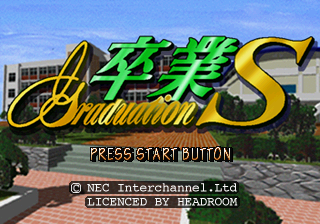 Sotsugyou S (卒業Ｓ) is a simulation game developed by Headroom and published by NEC Interchannel for the Sega Saturn. The game comes with a notebook and badge in a foam insert. Main article: Sotsugyou S/Magazine articles. 1_ABS.TXT TXT (Abstract) 167 About this game.